The client: Veeam is a company that helps organizations meet recovery time and point objectives of less than 15 minutes for all applications and data through a fundamentally new kind of solution that delivers: high-speed recovery, data loss avoidance, verified recoverability, leveraged data and complete visibility. Founded in 2006, Veeam currently has 37,000 ProPartners and more than 183,000 customers worldwide. In short, Veeam’s growth is exploding into the stratosphere! 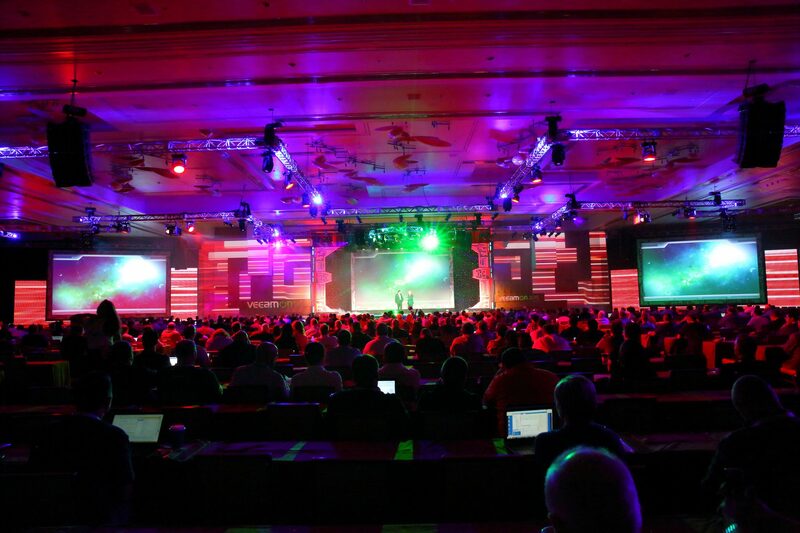 The event: VeeamON 2015 – the world’s premier data center availability event, took place in Las Vegas at the ARIA Resort & Casino on October 26 – 29, 2015. 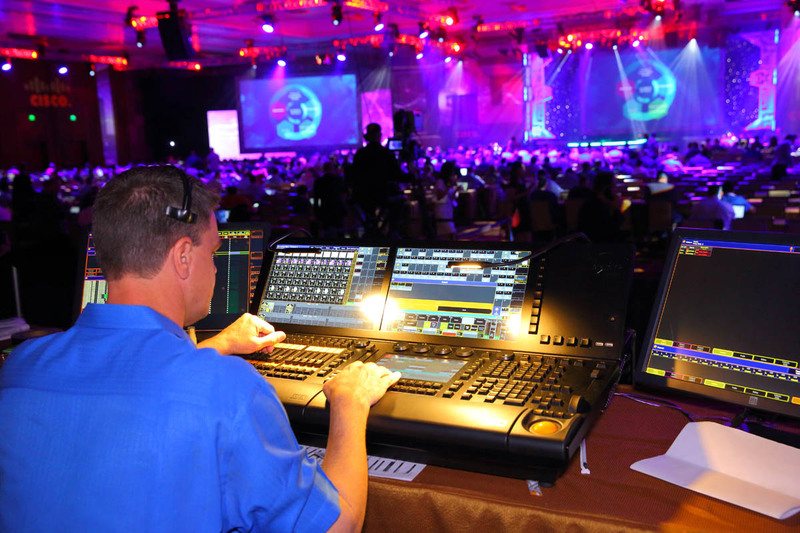 This was the second event for Veeam and its first time partnering with Multi Image Group. Veeam came to MIG (after the ARIA production team was unable to handle the complexity and magnitude of their vision) with a very specific creative request. 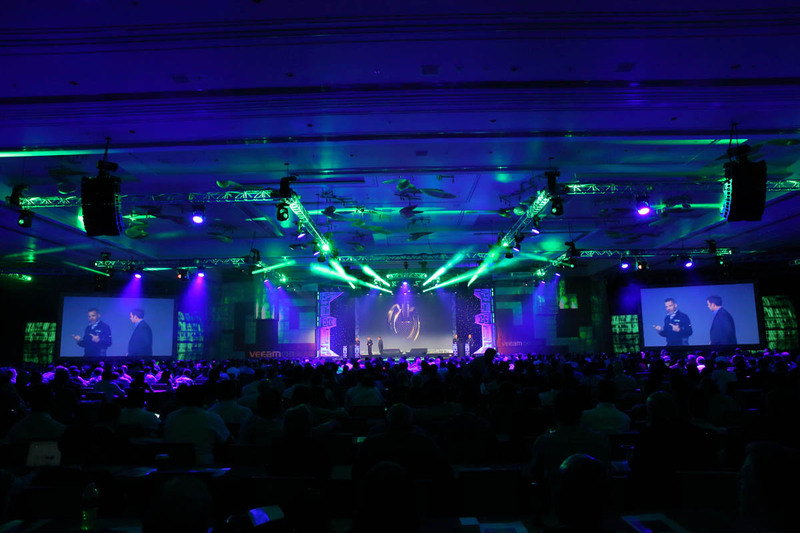 They asked MIG to develop, create, and execute the most electrifying opening its attendees (mostly data center software and software engineer managers) have ever experienced — all while reinforcing the event’s key message: Veeam offers a guaranteed solution to back up any organization’s data no matter the scale. To bring this compelling message to life, the client asked MIG to create a futuristic, sci-fi-inspired experience for the audience. They didn’t want to only to drive home their message of innovation, but to subtly and playfully tie into the upcoming release of the new Star Wars: The Force Awakens movie. According to the storyline (created by the client), all of the world’s data centers are crashing and need to be backed up by Veeam’s software. 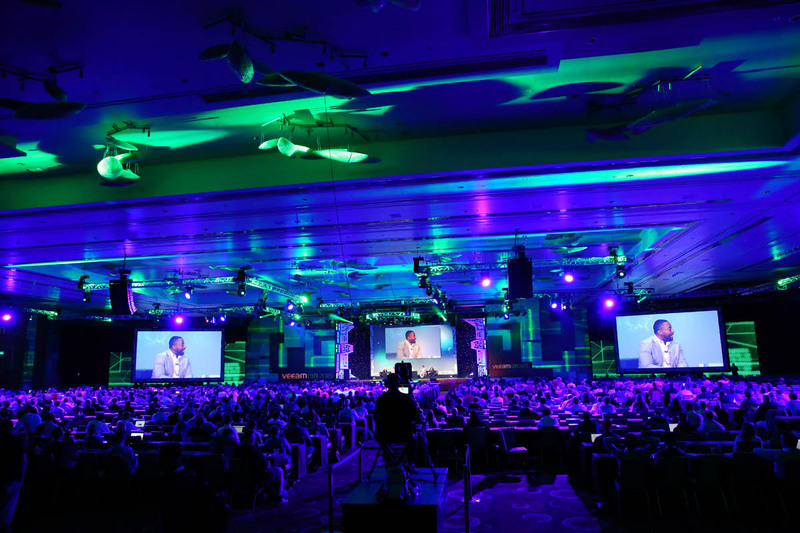 From this inspiration we created a WOW-inducing opening that took attendees on a journey from outer space to inside a spaceship, to saving the world’s data from extinction, to the dramatic introduction of the event’s keynote speaker! To pull off this 360˙ immersive journey, we used some of our favorite innovative technology tricks, such as: projection mapping 220 linear feet of the ballroom via a media server, 3D video animations, dual wide screen graphics, custom set pieces, overhead circle trusses with beacon lighting, LED, and laser lighting effects, CO2 cannons and foggers, star strobes, fiber optic star panels – and an accompanying sound track that blew attendees out of their seats! 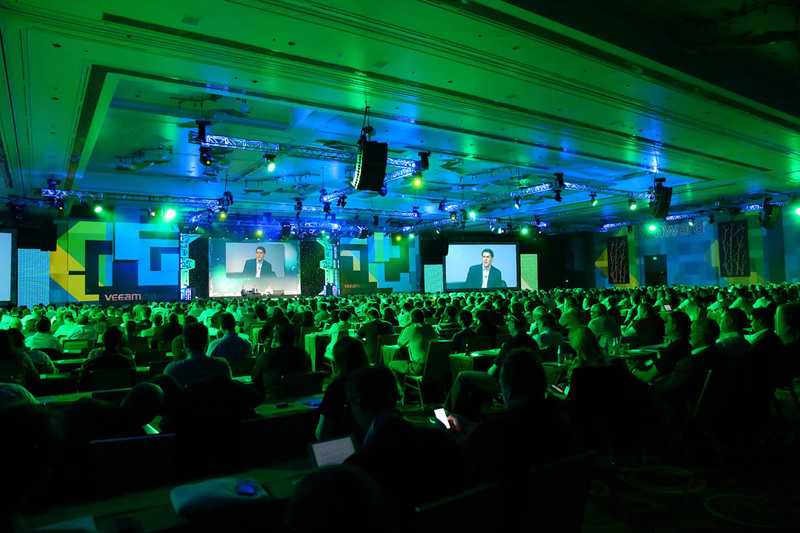 As for the result, we’ll leave it to the quote of one attendee’s Twitter post: “Man that was quite the intro!” As other tweets piled in with #VeeamON2015 it generated over 1,500 first-wave impressions on social media. 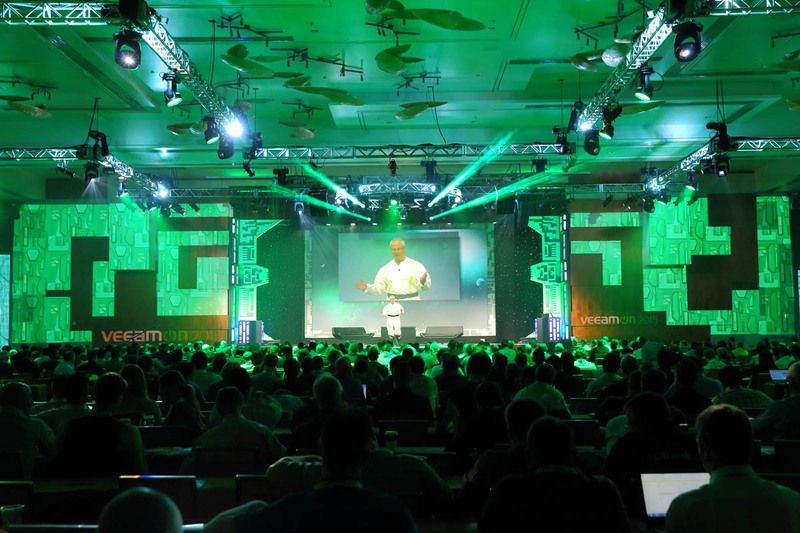 The event was a monumental success for Veeam, transformational for its attendees, and we’re excited to announce that this experience solidified Multi Image Group as Veeam’s partner of choice for the next VeeamON event. 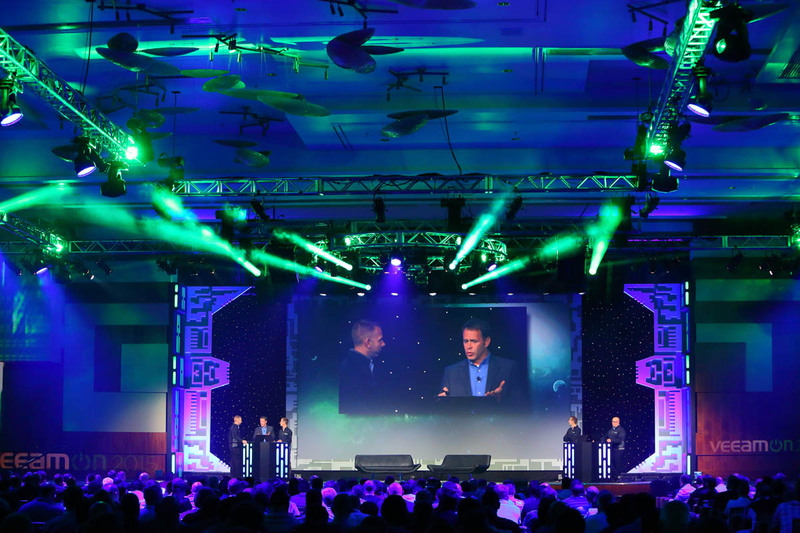 We can’t wait to see what journey we will send VeeamON attendees next! See you at #VeeamON2017! 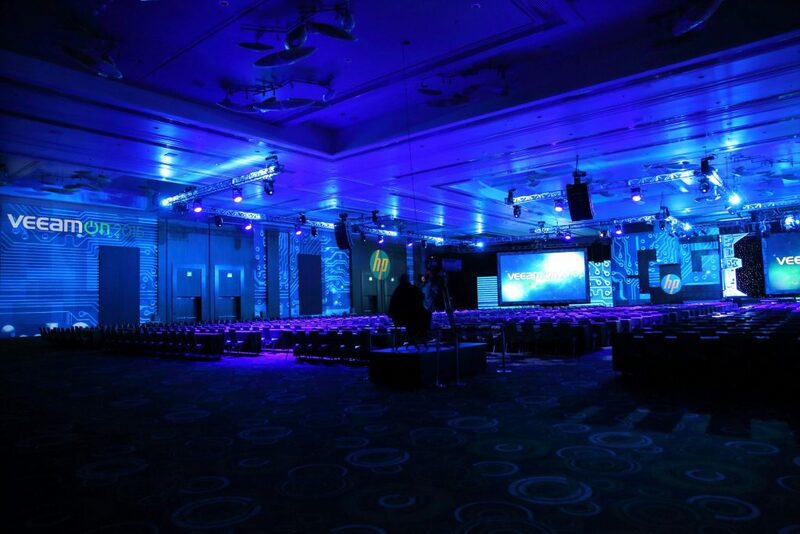 View LiveDesignOnline’s feature on Veeam’s event by MIG.